The acquittal of Baltimore police officer Caesar Goodson in Freddie Grey’s death on Thursday has spurred new doubts that the remaining four officers facing trial in the case will be convicted. Some, including the president of Baltimore’s police union, are now urging Baltimore state’s attorney Marilyn Mosby to drop the charges against the officers whose trials are still scheduled throughout the summer and fall, the Baltimore Sun reported. Since Goodson faced the most serious accusations of all six officers originally charged, experts say Thursday’s acquittal means it’s unlikely that any of the other officers involved in the case will be found guilty of their lesser charges. Goodson, who was charged with second-degree depraved-heart murder, had driven the police van in which Grey is believed to have suffered a spinal injury that resulted in his death. 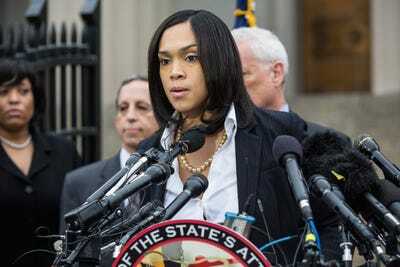 “This was the only case she possibly could have won,” Peter Moskos, an associate professor at John Jay College of Criminal Justice and former Baltimore police officer, told Business Insider. After an eight-day bench trial that concluded Monday, Judge Barry Williams cleared Goodson of all charges, including manslaughter, second-degree assault, reckless endangerment, and misconduct in office. Andrew Burton/Getty ImagesBaltimore City State’s Attorney Marilyn J. Mosby announces that criminal charges will be filed against Baltimore police officers in the death of Freddie Grey on May 1, 2015 in Baltimore, Maryland. It’s now fully within Mosby’s purview to drop or proceed with the charges against the remaining officers, according to former Maryland prosecutor Rene Sandler. Mosby has an “absolute obligation” to carefully review each case to decide whether they should proceed, Sandler told Business Insider. “My view of this case from the beginning was that the prosecutor rushed to judgment, that the prosecutor overcharged, and that the prosecutor didn’t take the time to fully and completely investigate this case before charging,” she said.